The Steven Moffat and Eleventh Doctor era got off to a strong start with ‘The Eleventh Hour,’ but ‘The Beast Below’ is an episode that, though bound to be forgotten in the long run, has a monumental task in proving that there can still be a consistently good output with a new showrunner and leads. And to that effect, it does a very good job, indeed. Initially, ‘The Beast Below’ feels like it’s going to be traditional Doctor Who fare as the Doctor and Amy explore dark corridors and search for the underlying menace. However, it’s the relationship between the two that really takes centre stage, as flaws and misgivings start to creep into what seemed like two perfect souls upon their first meeting. Amy pushes the Doctor into revealing some of his personal history, meeting some resentment along the way, but it’s this same desire to know that helps solve the problem in the end as Amy is able to look at the problem in a new light and in a manner that the Doctor simply cannot manage. After some hard feelings along the way, the two manage to come back together with a greater individual strength and joint respect for each other by episode’s end. That said, the plot and setting are both quite intriguing and topical, especially since it aired during a UK election campaign. 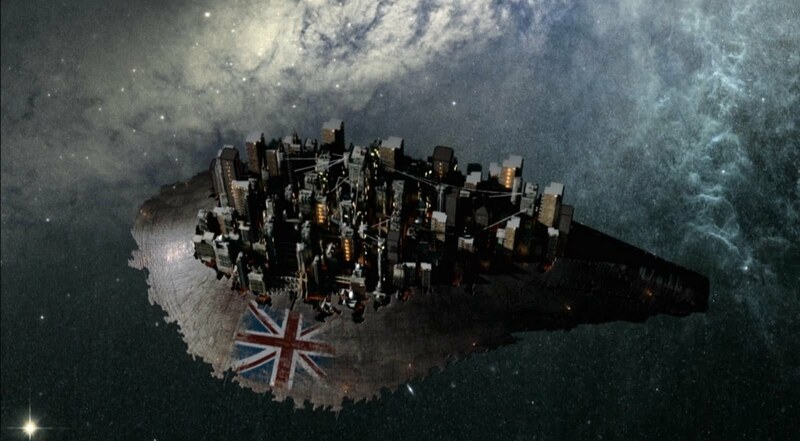 Here the citizens of Britain live upon a starship, given the opportunity to learn of the horrifying secret that keeps them safe and then to either protest or to forget. It’s hard not to notice the political undertones of this story, but they’re worked in subtly enough so as not to detract from the sheer enjoyment of the tale. And it’s quite telling that society chooses to forget in order to go about living normally and blissfully ignorant. It’s the buttons that allow such a choice that end up being the biggest antagonist of the episode, surpassing the visually creepy Smilers that house a secret of their own. This is best exemplified as the monarch Liz 10 sits in front of the screen and can’t make the decision of whether to rule for another ten years keeping everything as is or to abdicate and free the trapped creature that is being tortured in order to power the starship along, potentially killing her citizens in the process. Here, again, it is Amy who is willing to make that call, doing what is right when nobody else has the strength. Indeed, even the Doctor treads into murky territory as he grimly suggests that the star whale be left mentally incapacitated so that it won’t have to endure the agony of torture but still keeps the population afloat and alive. As the first standalone tale for the Eleventh Doctor and Amy that didn’t require introductions of new leads, ‘The Beast Below’ is a resounding success, turning surprisingly complex with political and moral issues toward the end. The star whale may have been victim to CGI budgetary constraints, but the core concept and overall execution of the episode are superb and bode well for this new era of Doctor Who. The crack in the wall returns and sets up an intriguing story arc, and the lead-in to the upcoming ‘Victory of the Daleks’ does nothing to dampen excitement.